Sometimes called a waffle iron, a waffle maker is a small electric counter appliance that is used for making waffles. These delicacies are breakfast fare with a sweet dessert flavor. Similar to pancakes but lighter and sweeter with a style that gives the appearance that they were difficult to make. The eggs in waffles are what makes them light and delicate. The waffle maker completes the presentation with an awesome shape and sometimes grid-like pattern design that makes them irresistible. Making waffles takes few ingredients and very little time, given the nature of the waffle maker. The appliance shapes the waffle including the series of grids which become lovely small recesses for filling with butter and/or syrup. Though not necessarily a kitchen essential, you will find a waffle maker in many kitchens, because it brings home the restaurant breakfast experience. If you're interested in buying a waffle maker, be sure to read about the different types below before making a decision. 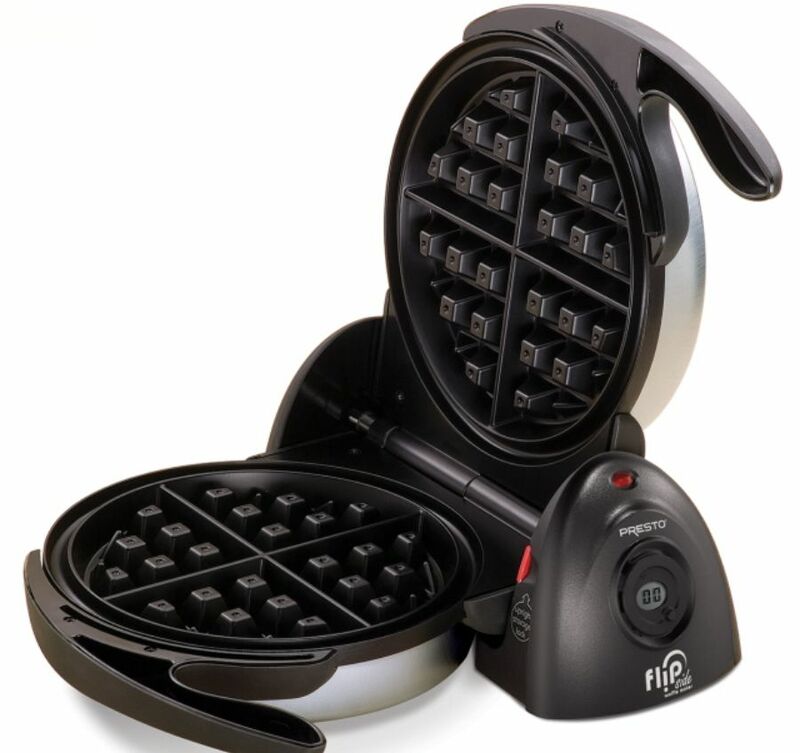 Waffle makers are sold mostly as stand-alone appliances, but one can also be a component of a counter grill or griddle set that has interchangeable metal nonstick plates. For the person who lacks counter or storage space, buying a combination appliance that can multitask with a waffle function, can be the ideal solution. On the other hand, a stand-alone waffle maker does not take much room to store - some can even be stored on their sides, though they do vary in size by design. There are basically two types of waffle makers. Those that make two or four small square 4" waffles (traditional style) and waffle irons that make oversized (6") round deep-pocket Belgian style waffles. Models that make other waffle shapes can also be fun to use. It's a matter of preference, though you should also consider the number of people you'll be serving. Deep-pocket waffles are a hit with many, and most of these large waffles can easily be separated once done, into smaller sections for sharing. Since waffles are made rather quickly (about 3 to 5 minutes), you can easily serve a family in short order. For some families, a waffle maker is a must-have quick breakfast appliance. They will make several waffles at a time and freeze them individually, once they have cooled. This can be extremely convenient for a fast breakfast fare another day. Previously baked small square waffles can usually be reheated in a wide-slot toaster, but Belgian deep-pocket waffles cannot. These larger waffles can be heated in a toaster oven, range oven or microwave. Many also like the taste of waffles in their cold state. Most square type waffle makers operate in a similar press-the-lid-down fashion. Belgian waffle makers, however, might be either flip-style or regular and I find the flip-style to be very efficient when it comes to even baking. The flip design allows the batter to freely flow into every part of the waffle mold and this can bake a much nicer waffle, than the regular non-flip style. Waffle makers are unique and designed solely for making and baking waffles. You cannot really use this counter appliance for anything else, though you can vary the taste of the waffles by using different recipes or mixes, or by adding spices such as cinnamon or nutmeg. As for price, waffle makers are extremely affordable. You can find well-known brands of double square waffle machines for around $40 and popular Belgian waffle makers anywhere from around $50-60 and higher. There's also a Babycakes version that makes stick waffles if you want something different. All have a nonstick coating that should be oil-brushed occasionally to ease removal of baked waffles and keep the coating truly nonstick. The rest of the appliance can be simply wiped. So clean up is fairly quick. There is a slight learning curve to making these, but with a little practice, you'll be able to make waffles with just the right amount of batter for a nice-looking waffle, while minimizing ​batter run-off. A Hand Mixer - Do You Need One? Is a Grill the Same as Barbecue? Do You Know How to Use a Cookie Press?